If there’s any style of beer that is a total quality crapshoot in North America, it’s the hefeweizen. For the past couple months I’ve been drinking every heffe I can get my hands on — from an alright Columbus, Ohio offering to a Seattle brew that asked the question: who puts ginger in a hefeweizen? (A: someone who apparently hates the actual taste of hefeweizens, but likes those Lipton nighttime teas a whole bunch). For the most part, I’ve been disappointed. 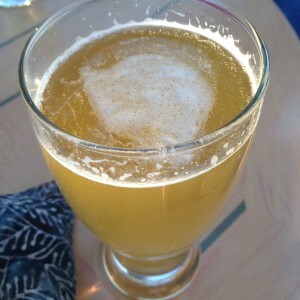 Which is why I’ve been dying to try Moon Under Water’s This is Hefeweizen (5.5 per cent ABV). If there’s a heffe with hype behind it in B.C., it’s this one. So, when my favourite local hipster watering hole Red Beard announced a Moon Underwater tap takeover this past Friday I was there, and This is Hefeweizen was first on my list of beers to drink. Now I’m almost regretting attending, because this is Hefeweizen blew so much of what I’ve been stuck with out of the water and I’m not sure I can go back. Like Russell Brewing’s White Rabbit, my other fave so far this year, this beer actually features those notes of clove and banana all lesser hefeweizens only promise. Moon is more mellow and traditional, with a banana flavour that stays clean and true all the way through the sip, rounded out at the end by those spice notes. It’s much less sweet than a lot of heffe pretenders, and more consistent. Where other versions seem to go a bit of kilter the more time you spend with them, the complex, hazy flavour stayed with me until the tail end of the tasting session — when I ordered an appetizer with arugula and garlic and messed up my taste buds hard for about half an hour. Worth a note as well is Moon’s Berliner Weisse (3.2 per cent ABV), a nice lower-alcohol sour option that reminded me of my Tom Collins and whiskey sour drinking days. It’s got a super-light profile and made late-evening patio drinking bearable even in the Kamloops heat. Light Side of the Moon and Hip as Funk, were good as well, though both are less engineered to my own personal tastes. But, here’s the dilemma: Now that I’ve started to fall for this Victoria-based brewery, I have no idea where to find any of what I liked again. While I’ve seen Moon’s stuff for sale locally, it’s only the IPA (whatever) and the dunkel (not a summer option in my books). Kamloops, take pity on a humble beer blogger and stock this stuff outside of one-night events. 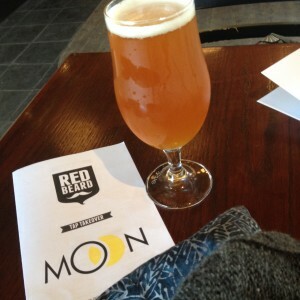 This entry was posted in Beer and tagged Moon Under Water, seriously Kamloops someone stock this, Victoria. Bookmark the permalink.